Free breakfast an indoor pool free Wi-Fi and a pet-friendly policy are favorite perks at the completely non-smoking La Quinta Inn Missoula. This hotel has 80 rooms spread over three floors. All rooms feature microwaves refrigerators coffeemakers and TVs with premium cable channels. Begin your day with La Quinta's free Bright Side Breakfast and enjoy fresh hot coffee and waffles or other goodies with your complimentary newspaper. The hotel also offers an indoor pool and hot tub free Wi-Fi a business center and a guest laundromat. On-site parking is free for guests and pets are welcome. 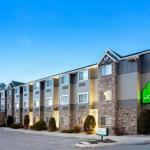 La Quinta Inn is right off of I-90 near a string of restaurants and bars. Downtown Missoula the Carousel for Missoula and the Missoula Art Museum are within four miles. Pay a visit to the Smokejumper Visitor Center three miles away to learn about fighting forest fires and to the Historical Museum at Fort Missoula five miles away to explore the city's Old West past. The University of Montana and Southgate Mall are also five miles from the hotel. Silvertip Casino is 12 minutes away and Missoula International Airport is a three-mile drive. Quiet dogs of all sizes are allowed for no additional fee; there is a pet policy to sign at check-in. A contact number must be left with the front desk if there is a pet in the room alone.